The Butler girls golf team, pictured left to right, Hailee Perry, Lexi Crawford, Breanne Kroeker, Savanna Dunlevy, Allison Zebney, and Hailey Zeller, show off the Greater Western Ohio Conference North division trophy on Wednesday at Beechwood Golf Course in Arcanum. ARCANUM — The Butler girls golf team fired a 434 to edge Troy for the Greater Western Ohio Conference North division title on Wednesday at Beechwood Golf Course in Arcanum. Butler was sixth in the overall conference standings. The division title is the first for the Aviators since 2011. 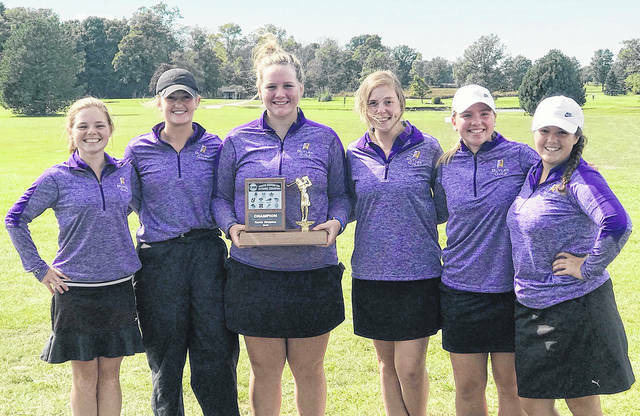 Three of Butler’s golfers, Lexi Crawford, Hailee Perry, and Savanna Dunlevy, qualified as individuals to the Conference Championship held Saturday. Crawford shshot 104 while Perry and Dunlevy each shot a 108. Allison Zebney shot 114 and Breanne Kroeker had a 130.